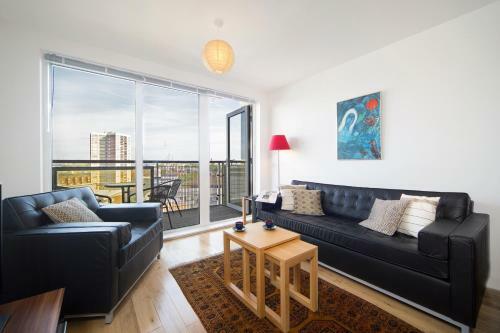 This is a smart, stylish one bedroom apartment in the historic Royal Arsenal by the River Thames in London SE18. This historic area has been transformed in recent years and become a desirable part of south east London with trendy pubs and cafes right on the doorstep. This property has beautiful decor throughout including a gorgeous fitted kitchen which includes a range of appliances including an oven, microwave and dishwasher. It leads to an open plan lounge area where there's comfortable seating and a large television. The sleek bathroom includes a bath tub with overhead shower and a TV. Fast-changing Woolwich in London SE18 is a historic Thames riverside town which offers excellent public transport links. Catch a train into Greenwich or central London or hop on a DLR to Canary Wharf or the City. Thames Clipper services are also available and Crossrail is soon to open. 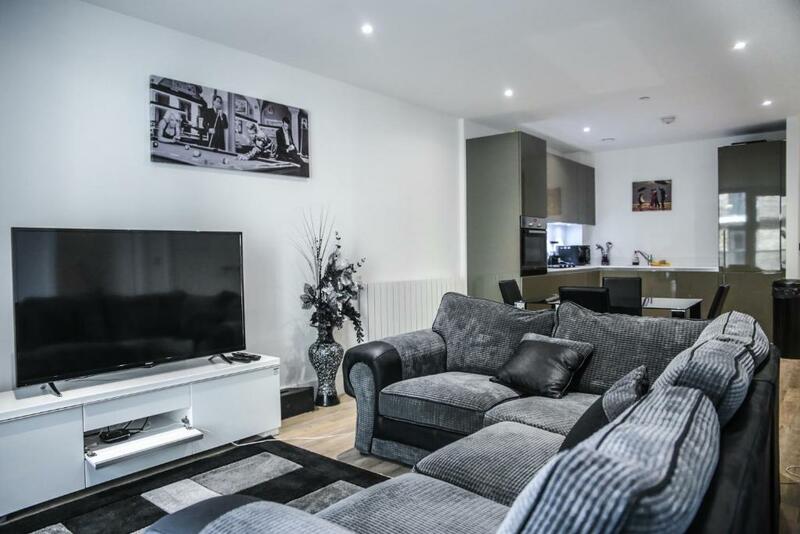 We've listed serviced apartments in Woolwich for comfortable self catering stays in modern accommodation. Thames Clipper boats provide services from the Royal Arsenal Pier at Woolwich westbound to the O2, maritime Greenwich town centre, Canary Wharf and in to central London. Soon-to-open Crossrail station providing fast tube style access on the Elizabeth Line to Canary Wharf, the West End and West London. Beautiful early-20th century town hall with council offices, register office and spaces for hire. The town hall is directly opposite council's newer offices at The Woolwich Centre where this is also a large public library. Railway station with trains in to Greenwich and central London or east towards Kent. DLR services to City Airport, Canary Wharf and the City of London. Southeastern trains provide services to Greenwich, central London and Kentbound in the other direction.